Marmite Chicken is probably more famous than Bovril Chicken. But since I only have Bovril at home, Bovril Chicken it shall be then. It is also my very first try and I am quite pleased with how it turned out. There are two steps in this recipe. The first step is to fry the chicken and the second is to cook the bovril sauce before coating the chicken with it prior to serving. You will need to have fast hands with cooking the sauce because the sauce can dry out pretty fast. However, if you add too much water (to prevent drying out), it would be too runny and not as nice. Anyway, don’t let that fear you into trying this dish. It’s actually an experiment on my part and it works! 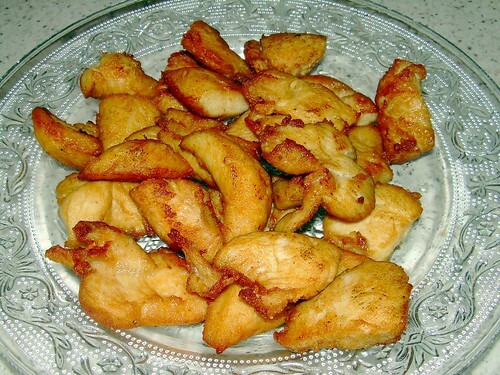 Marinade chicken for 30 minutes or longer and deep fry till golden brown. Set aside. Leave approximately 2 tablespoons of cooking oil in wok and saute garlic and onions till fragrant. Add seasoning and water and bring to boil. 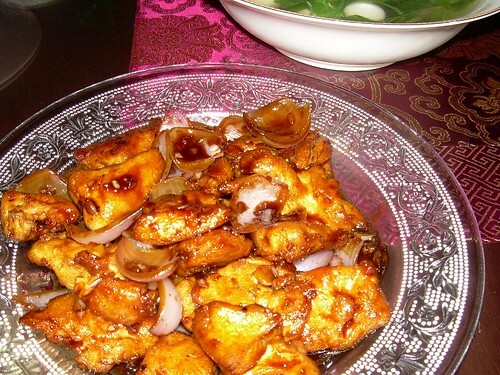 Return fried chicken pieces to wok and stir well to coat the sauce over the chicken. hi, just happen to click to ur blog while i am looking for some recipes. Just wanted to say that i just tried to cook vegemite chicken days ago and the recipe i found online is slight different with urs. May be u can try my recipe and i will definately try urs 😉 Enjoy cooking !! OH that looks delicious. I don’t know what bovril is though. I wonder if I can find it somewhere here? This would definitely be kiam si one. How can use bovril, soya sauce, salt and oyster sauce?? Sure to give me high blood pressure. Haha… other than that, looks good.